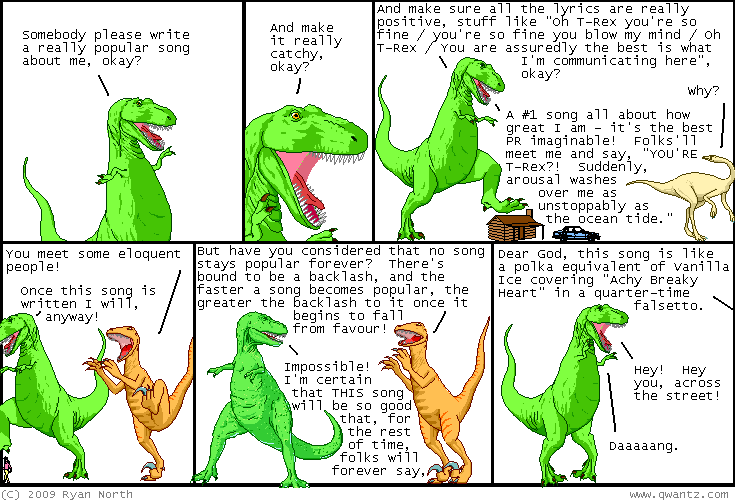 Dinosaur Comics - February 27th, 2009 - awesome fun times! This comic is from February 27th, 2009! I didn't write things down here back then. Or maybe I did, and they are now LOST FOREVER. But here is a random merchandise image; perhaps you are... tantalized? One year ago today: it's changed from skateboard simulator to 'old man on the porch yelling at kids to get off his lawn revenge fantasy realizer', and i'm - i'm happy with that.